If you’re in town this holiday weekend, good news! We’ve got you covered for July 4th AND July 5th. 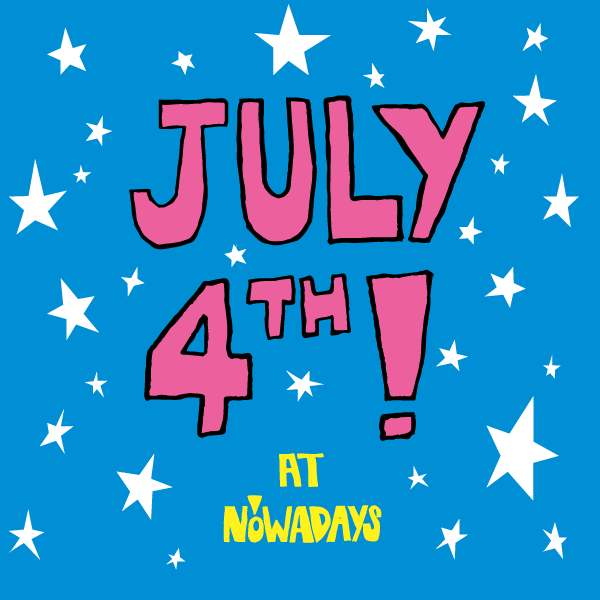 For the Fourth we’re doing a back yard barbecue at Nowadays. It’s not a dance party, but it’ll most definitely be a good time. Eamon and Justin are bringing down back-yard-appropriate-LPs from their home listening collections, and they’ll be playing them in full, on vinyl, from noon onward; the Nowadays kitchen crew (who generally keep it all-American) are adding corn dogs and bomb pops(!!!) to the menu for extra America-ness; aaaaaand, finally, Eamon’s organizing a ping pong tournament. Sign up’s first come, first served, and matches start at 2pm. The winner shall be rewarded. Best thing about all that? It’s free. Just come down. Hope you have a nice mellow week leading up to the holiday. If you’re going out of town, have a great time, and if you’re sticking around, we hope to see you at least once!